The first Fed rate hike in more than nine years might not be the big event that the market has been anticipating. The first interest rate hike by the Federal Reserve in more than nine years will not be the big event that the market has been anticipating, according to a panel of fixed income strategists and portfolio managers who participated in a recent Envestnet Institute webinar. Their reasons have nothing to do with the latest market rout, which, has more than erased any gains in the stock market this year, and could potentially delay a Fed rate hike. They relate instead to the context in which the Fed will be raising rates and the history of market performance when the Fed has tightened policy before. The panelists were William Rodriguez, fixed income strategist at BlackRock; Mark Mowrey, senior vice president and portfolio manager at AFAM Capital and Innealta Capital; Scott Eldridge, director of fixed income product strategy at Invesco PowerShares Capital Management; and Frank Pape, director of consulting services at Russell Investments’ private client services business. Here are their reasons why investors and advisors shouldn’t be overly concerned about an increase in the Fed funds rate, the short-term interest rate that the Fed directly controls and that banks use to lend funds to one another overnight. Ultimately a Fed rate hike will lead to higher borrowing costs, but not right away — and maybe not at all for long-term loans. Mark Morey, senior VP and portfolio manager at AFAM Capital, expects short-term rates will rise over the next 12 to 18 months following Fed rate hikes but the long end of the yield curve won’t, resulting a flattening of the yield curve. If he’s right, then the rates on long-term loans like 30-year fixed mortgages won’t rise. On the other hand, Rodriguez said, the higher cost of Fed funds “will ultimately translate into a higher cost of capital [for corporations]” and encourage CEOs and CFOs to invest in capital projects sooner than later “for fear of rising interest rates it the future.” He said it’s already happening given the $124 billion in corporate debt issued in July. Despite conventional wisdom, Frank Pape, director of consulting services at Russell Investments’ private client services business, said markets have performed well after the Fed begins to raise rates. 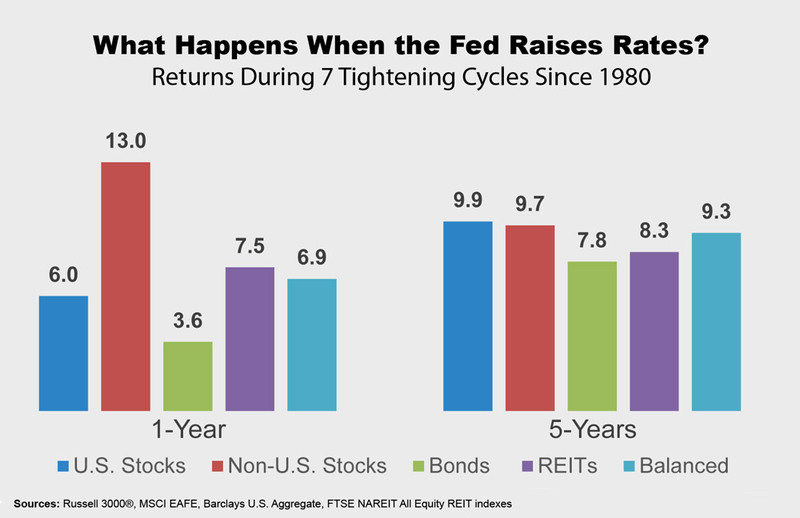 Looking at past performance of major stock, bond and real estate investment trust indexes during the seven Fed tightening cycles since 1980, he found that returns were positive in the one year and five years following, ranging as low as 3.6% for the Barclays Bond Aggregate to as high as 13% for non-U.S. stocks in the first year. Despite these positive expectations about the impact – or non-impact – of Fed rate hikes, the panelists cautioned that investors should still be prepared for more market volatility once the Fed makes its move, which could happen as soon as next month, October or December. “Keep enough liquidity” so you don’t have to sell into a panic, said Eldrige. “Focus on risk-adjusted returns, not just returns,” said Rodriguez.